Appearance can be everything. Not just in personal appearance, but in the appearance of a home or a business. A simple way to improve your property’s overall exterior appearance is to add mulch around plants, trees and shrubs. There are many different types of mulch available on the market that can be added to your landscape, but which of mulch is best for your Grand Rapids landscape? Here we will look at 3 of our most popular types of mulch; wood mulch, river rock, & decomposed granite, and give you a quick run down of each type. 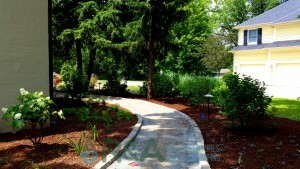 Wood mulch is the most common material used in many landscape beds in Grand Rapids, and it fits in nicely with many existing designs. Out of the three types of mulch we are looking at today, wood mulch is the least expensive of the three, and a wood mulch is good at keeping the weeds at bay without a weed barrier. Wood mulch is great for holding moisture, which is very beneficial to your plants during drought, and great for conserving water. A few things to consider. Wood mulch does break down easy, meaning it needs to be replaced (or added to) each year, it also doesn’t work great on steep slopes, especially in heavy rains where it is easily displaced. Unlike wood mulch, river rock can help slow down erosion in parts of the landscape, and it’s not easily displaced by heavy rain, like wood mulch. Since river rocks doesn’t need to be replaced (or added to every year) it is considered a very sustainable type of mulch. It is also quite versatile working great in pathways, walkways, around water features & in landscape beds. Like wood mulch, river rock comes in many different tones; some collections have more gray-blue colors, and others may have very light browns and tans as well as light gray-white. Out of the three types of mulch, river rock is typically the most expensive. It can also get really hot when baking in the sun, and should have a weed barrier underneath, unlike wood mulch. There are conflicting opinions over decomposed granite, but it is still a popular choice among homeowners. 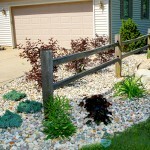 Decomposed granite is more sustainable than wood mulch, and it provides great drainage like river rock. However, it can sometimes be washed away with heavy rains. Unlike river rock, the final look and feel of this mulch will be much smoother, and it is often used on trails and pathways making it easy to walk on. A weed barrier should usually be used beneath this type of mulch. Decomposed granite typically falls within the mid price range, more expensive than wood mulch, but usually less than river rock. 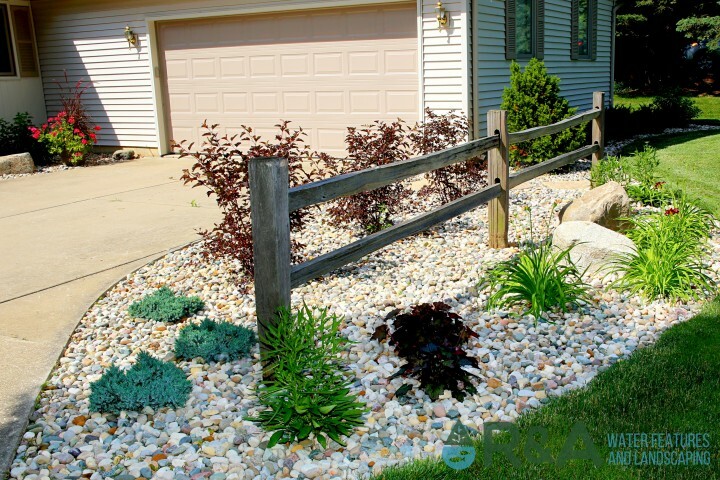 Some homeowners find that the decomposed granite in their Grand Rapids landscape is easily tracked in the home; by sticking to the bottom of shoes or even by their pets. All three of these types of mulch are good choices and would work for most Grand Rapids landscapes. 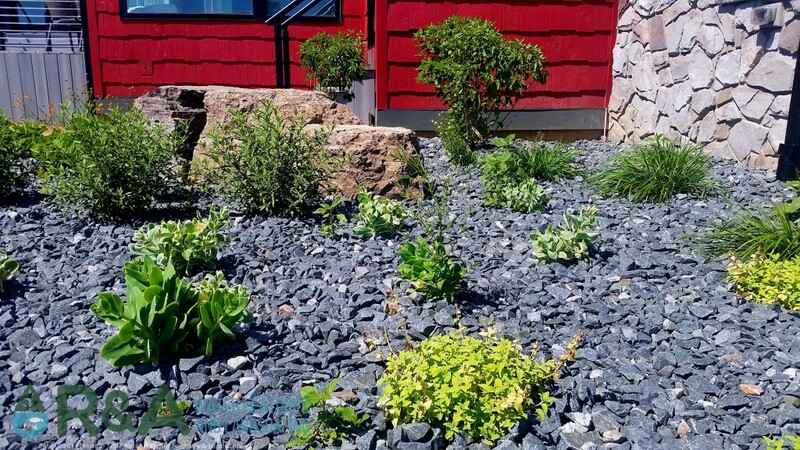 Another important considerations is the aesthetics value that a chosen mulch will add; wood mulch, river rock and decomposed granite all add a different look to your home or business, and typically all of them can be worked into an existing design. You may consider using different types of mulch as well; maybe decomposed granite for a pathway, river rock around a water feature or fountain, and wood mulch around plants. Check out some of our recent projects, as well as our blog, for inspiration on your next project!